We had a quick, but lovely meeting this August and again, we hosted Julie of The Intrepid Thread who came this month to demonstrate the Cricut Maker. Julie showed how accurately and with great detail the Cricut can cut fabric. And then after a quick break, we had sew ‘n tell and as usual, the quilts our members had made did not dissappoint. 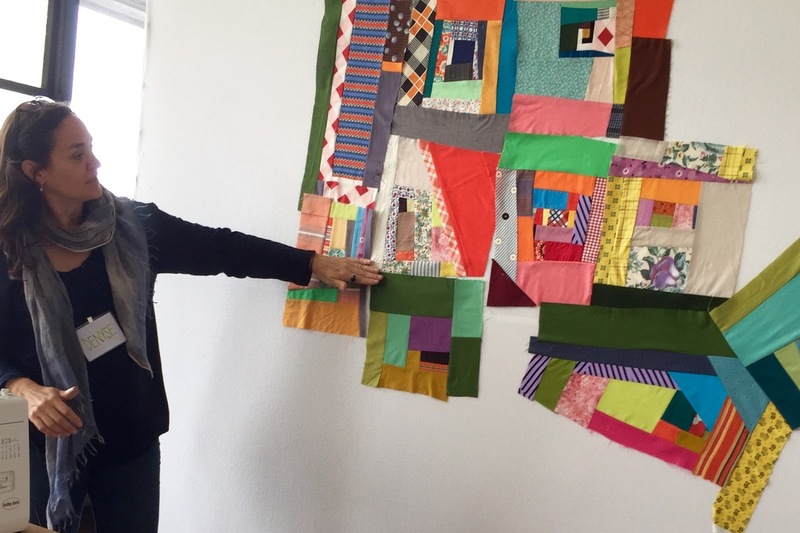 Later in the month, some members took Karen’s workshop called Improv Abstraction Log Cabin. Such a great, modern take on the most classic of all quilt blocks. Here is some of our work. Such great work done at our Improv Abstraction Log Cabin workshop with @capitolaquilter Swipe all the way through to see us at our best! We will see you soon at our next meeting, September 4th, 6:30 at the Capitola Senior Center. We met this July for our guild meeting and it was, as ever, visually beautiful with everyone’s exciting and innovative quilts. But first, we had several guild happenings to cover. Quilt Con charity quilt – This year’s design prompt is to use tiny piecing. We started making narrow strip sets at our sew day. For more information on this project see HERE. Blocks will be collected at the August and September meetings. The blocks are going to be chopped up and used to create something awesome. Future sew days (dates are TBD) will the be used as design meetings. Barn Quilt – We are so inspired by Renee’s Barn Block quilt that we wanted to make our own for our Opportunity Quilt. 26 of the 36 blocks were created at the last sew day, we hope to finish the remaining 10 blocks at the next sew day (date TBD). The color scheme is turquoise and peach. The quilt will be about 72″ square. We learned that our longtime and one-time officer Emily will be moving away to Texas and this was her last meeting. There was no time to prepare for a proper good-bye! Emily has been a part of the modern quilting community since its inception and was at the very first MQG meeting in Los Angeles. She lived for a time in Boise Idaho, and when her family moved to our area, we snatched her up and said you must join us and so she did. Emily was treasurer and helped shape and write our by-laws as well as set up accounting and aided in our guild becoming a non-profit. Our guild cannot send enough appreciation, warmth and well-wishes as she moves on to her next chapter. Here are a few of Emily’s beautiful quilts. Safe travels friend!! And, as always, our members showed us their quilts. brought a beautiful trunk show of her work and to discuss her evolution as a quilter and her ideas and process. Tricia spoke at length about how she is submersed in surface design and dying using reclaimed fabric. Most inspiring were her thoughts on quilting as art and her dedication to portraying her own perspective and aesthetic. Thank you Tricia for visiting us! We also hosted Julie from the Intrepid Thread who brought stacks of lovely fabrics for us to drool over. As ever, we had a beautiful display of our talented members in sew and tell. Renee’s block was won by Judy from the Block of the Every Other Month Club. This beautiful block was chosen by the Modern Quilt Guild as part of their block study for 2018. Pam Rocco’s quilt is a variation on the Cogs block. Lori made a quilt in Karen’s workshop on Improv Abstraction. We are so excited to see Karen teaching and we are lucky to have Karen teaching for our guild later this year. Mo made this fabulous quilt in a workshop with Tara Faughnan. Pictures do not do this postage stamp quilt justice. The visual impact is stunning. Come to our next meeting on June 5 at 6:30 for more visual inspiration and friendship. This month, we will be giving our partners our tote bags or zipper pouches. Swap meetings are the best – we can’t wait to see what you all have made for each other. The swap will start promptly at 6:30. See you then!